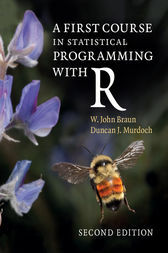 This new color edition of Braun and Murdoch's bestselling textbook integrates use of the RStudio platform and adds discussion of newer graphics systems, extensive exploration of Markov chain Monte Carlo, expert advice on common error messages, motivating applications of matrix decompositions, and numerous new examples and exercises. This is the only introduction needed to start programming in R, the computing standard for analyzing data. Co-written by an R core team member and an established R author, this book comes with real R code that complies with the standards of the language. Unlike other introductory books on the R system, this book emphasizes programming, including the principles that apply to most computing languages, and techniques used to develop more complex projects. Solutions, datasets, and any errata are available from the book's website. The many examples, all from real applications, make it particularly useful for anyone working in practical data analysis.